We live in bright and sunny California—so why would flood insurance be important? The fact of the matter is, anywhere it can rain, it can also flood. And, if it should flood, the last thing you want to deal with is paying for all of the damage out of pocket. While some insurance companies will cover a burst pipe, they usually won’t cover storm damage flooding unless you already purchased a policy. However, regardless of your insurance, you can always feel free to call the experts at SM Absolute to handle the issue for you before it escalates. A flood is defined as a “general and temporary condition where two or more acres of normally dry land or two or more properties are inundated by water or mudflow.” Some people live in the same home for over 20 years and never see a flood, but that doesn’t mean that it isn’t possible. You could experience a flood at just about any point. In fact, according to the National Flood Insurance Program, all 50 states have had a flood or flash flood of some kind in the past five years. There are some high-risk areas that are actually more likely to be damaged by a flood than they are a fire. As scary as that sounds, we know some of you are thinking that you’ve never seen a flood. So why get insurance? The Federal Emergency Management Agency (FEMA) found that the average flood claim back in 2013 was $26,156. Unless you have that much money laying around, an insurance policy is going to be your best bet. It is more common than you would think for people to find out that their homeowners’ insurance policies don’t cover flooding; they only cover water damage that happened from an issue inside the home. 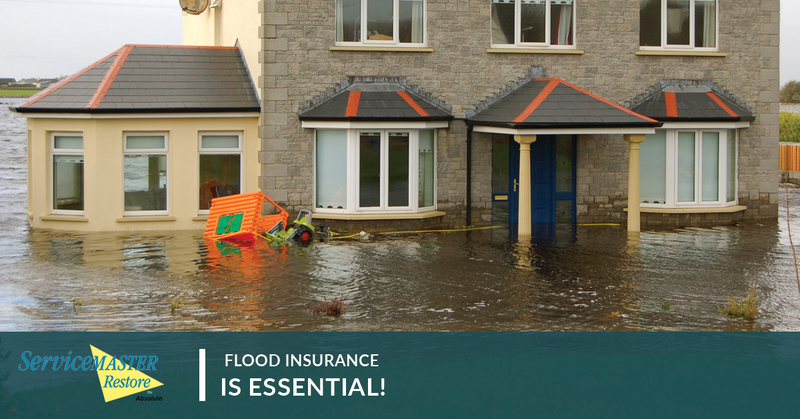 Flood insurance covers all the losses from a flood, as well as issues that resulted from heavy and prolonged rain, coastal surges, melting snow, or even levee dam failures. Most of the time, storms lead to floods. However, melting snow and changing landscapes can also contribute to flooding. Any paved ground also eliminates the possibility of the land absorbing excess water, and our recent fires have ruined any potential blocks we would have against mudflows. Unfortunately, the fact is that no one is safe from flooding completely. Even low-risk areas account for 20 percent of all flood claims. Flood insurance can be purchased through the NFIP, and many companies will act as agents for insurance sponsored by the NFIP. The good news is, the price is the same anywhere you go. There is no need to shop for rates; you’ll get the best rate possible depending on where you live. Renters can purchase flood insurance too, especially if you are in charge of handling your own repairs. You may need different property insurance with your contents flood insurance (what protects personal belongings). Look for all additional options if you need. Flood insurance policies typically have a 30-day window of activation. That means that if you call your agent as water is pouring into your home, you will not be covered. Just a couple inches of water could leave behind thousands of dollars of destruction. This includes your possessions, the structure of your home, and even the quality of the air you are left breathing. Flood insurance typically requires an insurance agent, so make sure you call your chosen company as soon as you make the decision to protect your home. It is never easy to deal with flood damage, but knowing that your belongings and property can be saved will provide peace of mind should you be forced to evacuate or be faced with thousands in damage. If a disaster has struck your home, whether you have flood insurance or not, please call SM Absolute! We want to make sure that your home is perfectly safe to return to and will not harm your family in any way. That means that we remove any standing water. If we find any, we can take care of that too. For those of you with flood insurance, we would be happy to reach out to your insurance company and negotiate a rate with them. That means that you can call us as soon as you see the damage and get our team in there in no time to repair the problems. We proudly serve San Diego and the surrounding areas when it comes to restoring homes and property when they have been damaged! When you are in need of fire damage restoration or water damage restoration, please reach out to us today!